Remember when we sawed off the awkward hump on Brennan’s changing table? Feel free to see the madness for yourself here. We had this drawer left over. Of course my husband claimed it as trash and I could feel myself in slow motion saying, “Nnnoooo..” as he was headed out the door to toss it. I saved that drawer’s life, you know. I found the legs at a yard sale for a dollar for all four. I’ll take em! Our bedroom is constantly littered with Brennan’s books so I was looking for a way to hide a stash of books there permanently. 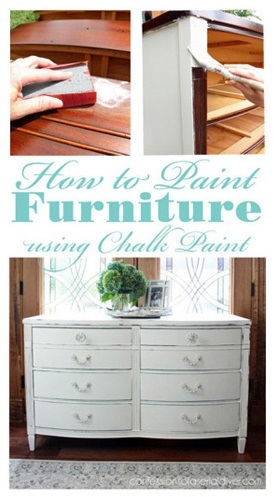 So I started with a coat of homemade chalk paint in cottage white. Then decided I wanted a different feel. So I gave it a second coat in Annie Sloan’s Graphite. 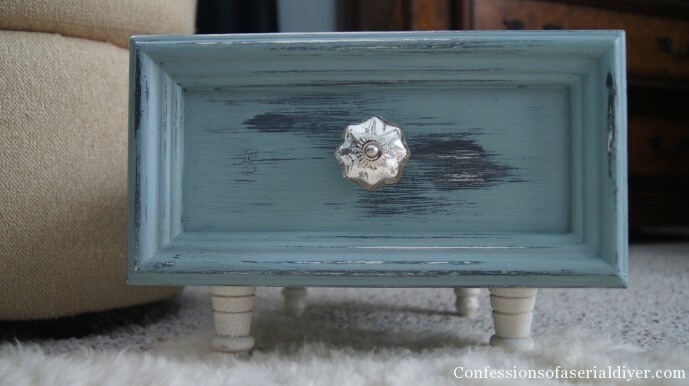 Finally I topped it off with Annie Sloan’s Duck Egg Blue (my new favorite!!). Then I sanded it a bit and gave it a coat of her clear wax. Add a pretty mercury glass knob from Hobby Lobby and the transformation is nearly complete. All that was left to do was add the feet. For a quarter a piece, I thought these would do just fine. 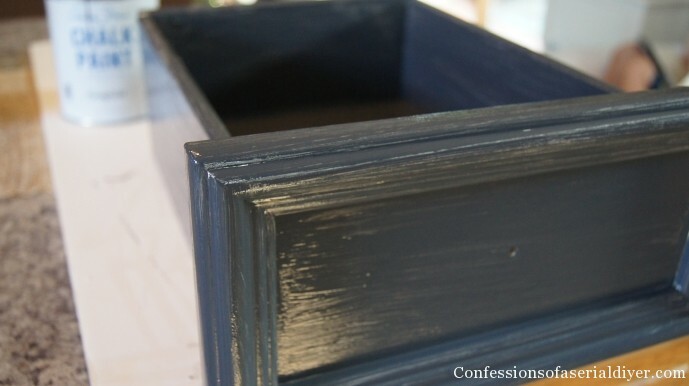 I spray painted them in Rustoleum’s Heirloom White, then screwed them in place from the top. Now we have the perfect spot to toss all of Brennan’s books. And it only cost me $3.50 + paint, which I already had! 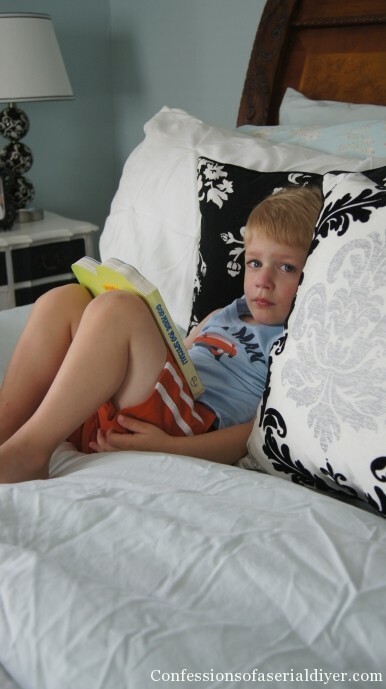 Now if we can just get him to read them on the sofa instead of messing up mommy and daddy’s bed every. single. day. Christy, what a great idea and it turned out so cute! Love the color and ok, now I now I need to grab the drawers out of a dresser I plan to replace soon! 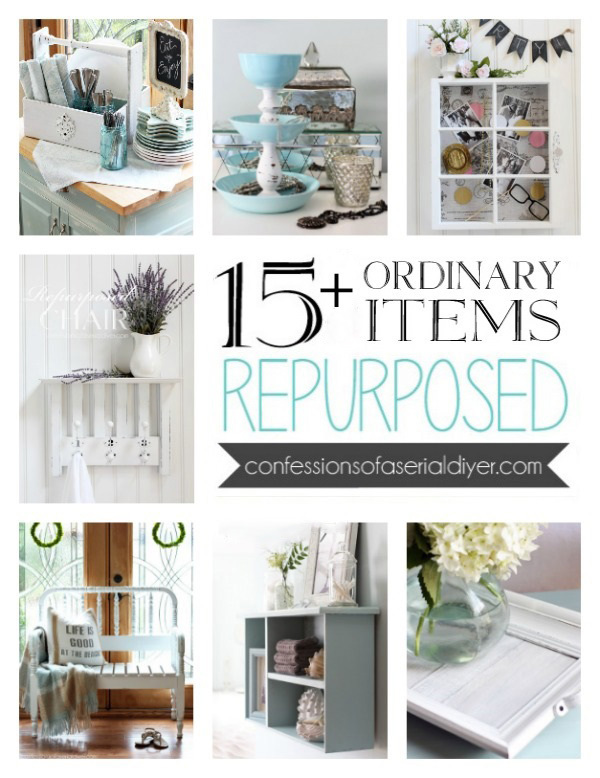 Thanks so much for sharing and pinning – have a happy Tuesday! I love it! Visiting you today from Dorothy Sue and Millie B’s too! What a great idea. You did a great job, I really love the color, and the rustic look. 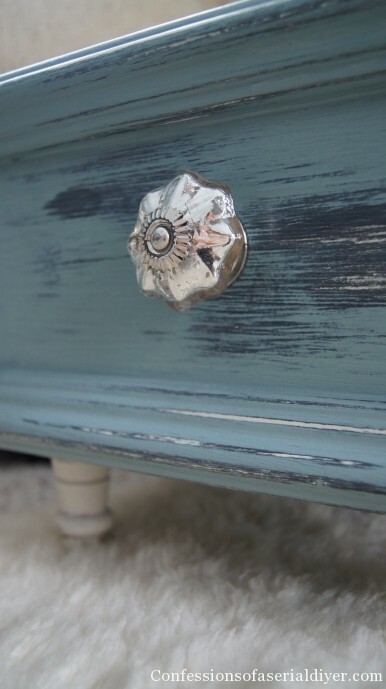 Don’t you just love Annie Sloan’s chalk paint? I used it on a few things. It’s great! Thanks for sharing! My husband was on his way to toss it…I think he’s finally starting to know better! By the way, how soon did your husband notice the molding you stole from your own trash and “hid”? That post almost made me pee my pants! If that isn’t smart thinkin’ I don’t know what is. Hard to throw something away til you figure out what can be done with it. Glad you saved that dear drawer. That’s perfect for any thing to store it in a cute way. Love the colors and knob, awesome girl. Love the way you think. No I couldn’t say no to that face either. Before you know it he’ll have passed the phase he’s in that needs to be on your bed. It’s just a messy bed Mom, the world won’t end. I can say this to you cause I’ve been there, done that. I can remember “women older than myself” telling me things I didn’t want to hear and thinking they should mind their own business, they didn’t understand. but I really do. Enjoy that little guy. he’s very special, a one and only. Thank you JaneEllen for your words of wisdom…I let that little guy do just about anything since he’s my last. That may get me in trouble one day ha ha! 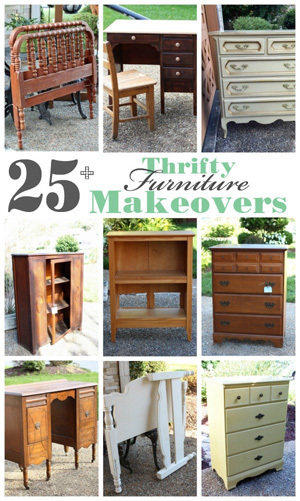 This is such a great upcycle project! I LOVE what you did with the drawer. Thanks so much for the inspiration! What a wonderful and creative way to store books or anything, for that matter! You did a great job on this project. wow! 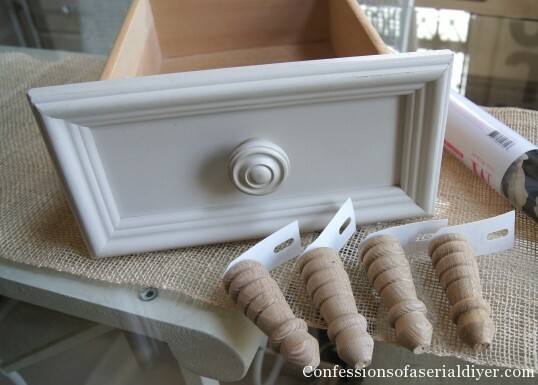 I love what you did with this drawer! How very clever and resourceful! What a sweet face too! I’d love for you to link this up to our new All Things Thursday Blog Hop! Hope to see you there! Thanks for the invite, Nici…just linked up! And congratulations in your one year blogiversary!! Awesome save! 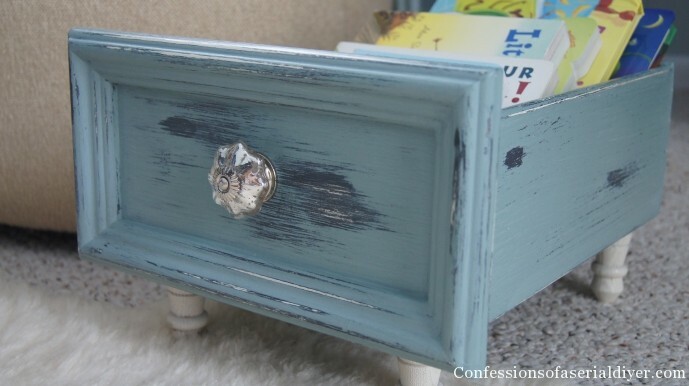 So cute and LOVE your color choices and the new knob! Hopped over from The Dedicated House and I’m happy to be your newest follower! Would love to have you stop by for a visit! 🙂 Blessings ~ Judy. Thanks for the sweet comments, Judy! Heading over to check you out! How cute, great re cycling! Thanks, Kim! I knew this little drawer would serve a purpose sooner or later! This is absolutely adorable. I just love it! I love it! The different mix of colors is super and legs for a quarter each? Girl, you just rocked this drawer! I noticed the new knob too so don’t think I was ignoring that, lol! And no, I could not say no to that little face. This drawer turned out so beautiful! I think the glass knob adds the perfect touch. 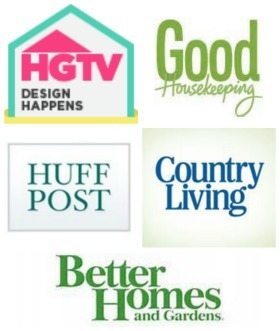 I found you at Give Me The Goods Monday & I’d LOVE it if you could link up this post to my Frugal Crafty Home Blog Hop. We love seeing DIY upcycle projects like this! Thanks! Great job on this upcycle project! 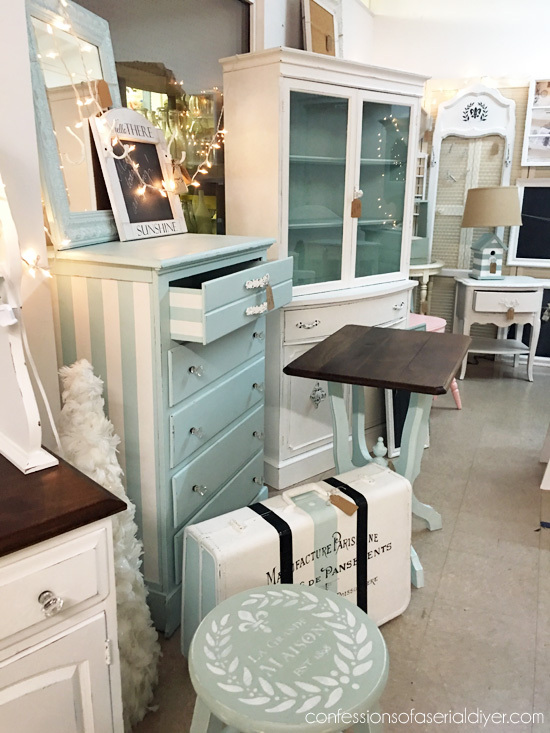 Your beautiful drawer was picked in my roundup of features from last week’s All Things Thursday Blog Hop. I hope you’ll visit again tonight and link up more of your awesome projects! This is so cute! Love the little legs. Thank you so much for linking up to Suburbsmama. Hope to see more from you soon. What a great way to use an item that would have ended up in the trash. Thanks so much for sharing with this week’s Throwback Thursday party. You are so darling!! And your work is nothing short of brilliant – keep it up! This drawer turned out great! 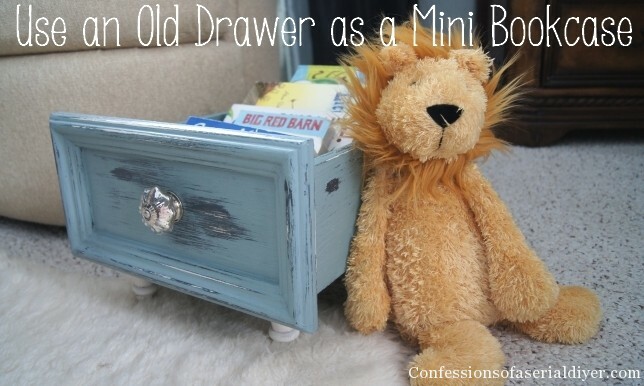 I have an old wooden tool box in my bedroom with kids books. There are books in every room of my house! I suppose one day I won’t have books and baby dolls strewn across my bedroom…. 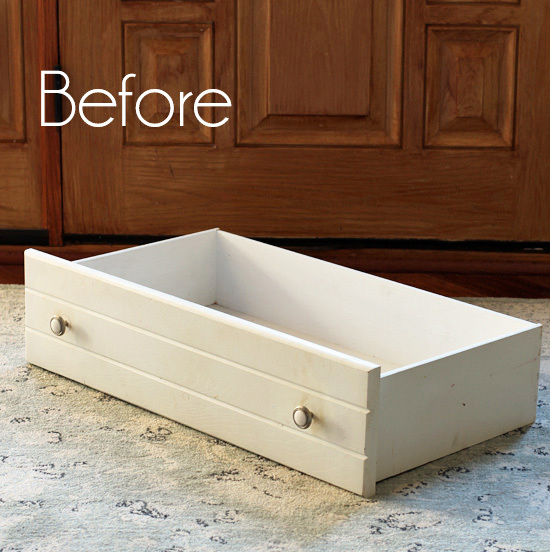 I have three drawers from a salvage store that I’m currently working on changing up, so I loved seeing how your transformation turned out! Did you screw the furniture legs in from the inside of the drawer? I was thinking about using some old banister spindles for a similar look on one of my drawers. Love it! I need one to hold my dogs toys! Pinning too! Gorgeous AND clever project! 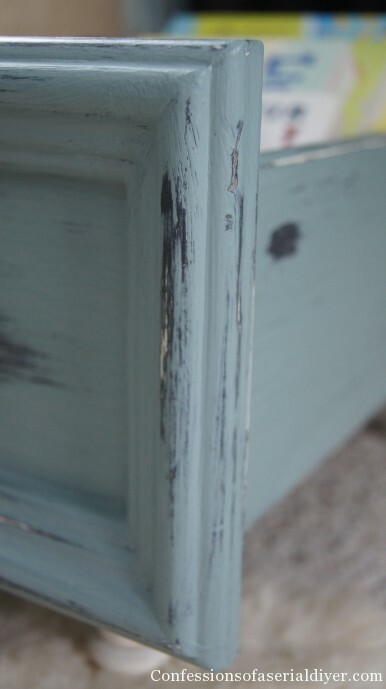 Love the color-distressing, perfect. Great idea! I have a couple of old drawers lying around…collecting junk. I should try something like this. Hi! I finished the first of 3 drawers that I’m working on. I’ll add legs to one of them eventually, but wanted to show you the one that is complete, since you inspired me to get moving on it! Awesome, Amy Jo! Checking it out now!